Smith Westerns have released a short film providing a brief glimpse into the recording of their very well-received album Dye It Blonde. The carefree sounds of youth and drama on the record are too well crafted to have come without their share of careful and deliberate planning, and the video shows the young rockers matching wistful gazes and awkward pauses with skillful musical craftsmanship. 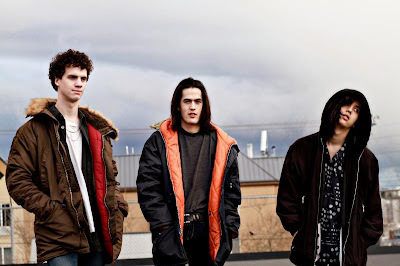 There is a cool scene that depicts guitarist Max Kakacek running through some heavy riffing, and another where lead singer Cullen Omori discusses the 14-hour trip to Chicago that would decide whether anyone ever heard from Smith Westerns again. I guess it went well. Check out the video below and catch the band live on Wednesday, May 11 at Lincoln Hall. Smith Westerns: Die With Your Chin Up from stereogum on Vimeo.